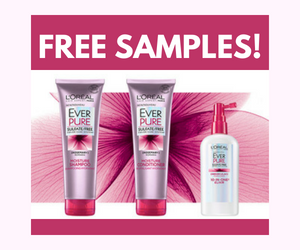 Hurry and claim your free samples of L'Oreal EverPure hair care products. To get this offer, scroll down on the offer page to find the registration form. Simply fill in your shipping information and answer some questions about your hair type and needs. Get your samples now while supplies last! If you want more free stuff check out our Free Samples page.